I had a great time with Possum last night. 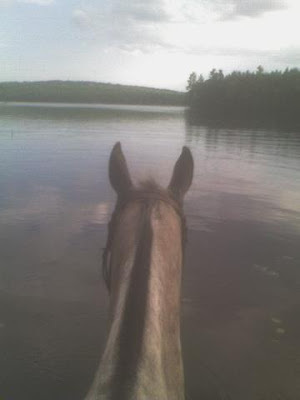 I got to the barn and decided that we would take the quick 6 mile round trip to Moose Pond where we like to go swimming and walking around int he water. It was such a hot day that I thought it would be a good thing to do and a treat for both of us. It was nice to spend some Time with Possum and I was able to take a few pictures with my camrea phone. One thing that I didn't get a pic of was a purcupine that we saw on the trail. We were walking through the woods and I heard this scratching noise and a look up and a cute little porcupine was climbing a tree. Possum just looked at him with curiosity. It was really neat. Enjoy the pics. 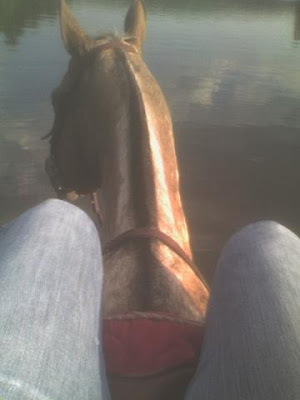 FYI I did not go really deep in the water because I was fully dressed and had my niuce saddle that I really didn't want to get dunked. 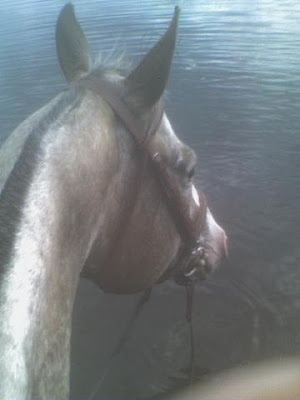 Possum again was a trooper and went anywhere I asked him to and splashed right down into the water. He really is a good guy! My knees are in one pic because I was trying not to get wet! 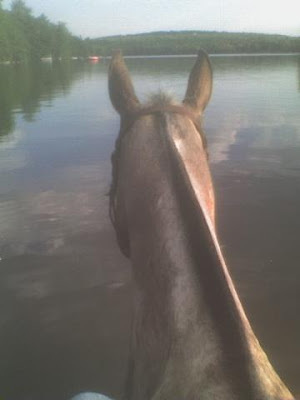 I had a gelding who liked to swim - it was so fun, and yes if I wondered out too far he would totally dunk me - go down one side then stand up and go down on the other side. Isn't playing the water fun though? - Have you gone swimming with him? Yea we have gone swimming almost every year. 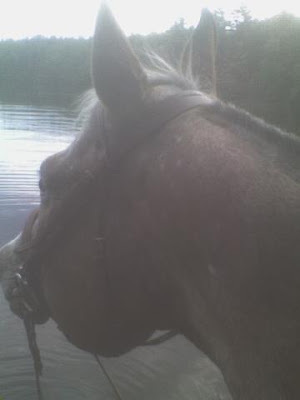 He loves to go, but I need a strap cause he has no mane so there is not much for me to hold on to while I swim with him. 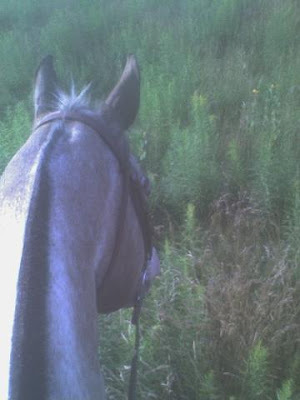 I'm planning on taking him tomorrow if the thunderwhowers hold off cause it's supposed to be really really hot! One more time: I LOVE your horse. He's not only gorgeous, but he sounds like a lot of fun.